Canon is a company which generally runs second only to Nikon when it comes to cornering the market on consumer photography. 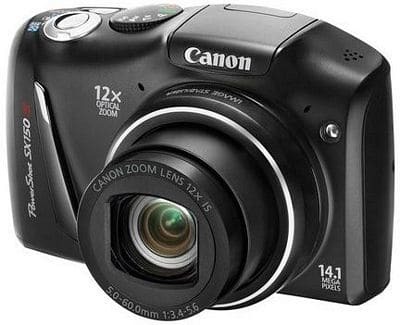 When you look at the latest in the PowerShot line, the SX150 IS, you will find that this chunky, rugged little camera is good for most consumer uses, such as general photography, but there are still areas in which the camera can tighten up its overall game. The stabilized 12X optical zoom offers users great image quality at low ISO settings. The SX150 IS has comparatively low battery life – on average, roughly 100 shots – when you look at similar models. However, the camera has an abundance of features which makes it the likely go-to in a pinch. The camera runs on AA batteries, which contributes to its chunky design, but also contributes to its convenience for the consumer. Unfortunately, that’s where the low battery life comes in. Compared to rechargeables, the AA batteries don’t really last that long; however, they are relatively cheap and easily accessible. Start-up time on the camera is also quite slow, as is the transition time between shots, particularly if you’re using the flash. Transition time can be as much as four or five seconds, but there is a “flash charging” message which comes on – helpful if you find the transition times to be particularly tiresome. Camera-shake isn’t really an issue, although it should be mentioned when photographing people or pets, shutter speed needs to be high. Image stabilizers can’t correct for a moving target. The camera loves good light, though, and great images come from photos taken when there is a lot of light. In fact, there are ways to bump up the color, thanks to the color effect modes present on the SX150 IS. There is minimal clipping when there are bright highlights, but this is a very slight issue. For detail shots and web photography, this is a perfectly fine camera. Its use should be avoided, however, for more professional shots that don’t require much of a flash. Camera images are nice and crisp at the frame’s center at all focal lengths, but there is some dropoff on sharpness around the edges. By far, the biggest issue is the noise. ISO starts at around ISO 80, but the higher you go, the worse the noise gets. It’s generally recommended that the camera be used at lower ISO sensitivities in order to make optimal use of the camera and its features. As far as the video goes, there are no HDMI cables for an HDTV connection. Video quality tops out at about 720 pixels, with the standard definition no greater than 640 X 480. In video mode, the camera is best when lighting is bright, and if you’re looking to eliminate any wind noise, you might consider using the wind filter, but don’t hold your breath. The filter is rudimentary at best. You can, however, zoom during video recording, which is a feature not previously available on other budget Canon cameras. As a whole, the SX150 IS is a perfectly adequate camera for the photographer looking for a good camera they can take anywhere. Its rugged build allows users to take it in almost any conditions, though the features on it don’t deliver the best of what they could. It is, however, a good budget-style camera. Canon doesn’t disappoint.